Pies sign College basketballer Meet Darrean Wyatt, a former College basketballer who has signed as a Category B rookie for the 2016 season. 200cm Darrean Wyatt has joined Collingwood as a Category B rookie. The Collingwood Football Club is excited to announce the signing of Melbourne-born basketballer Darrean Wyatt as a Category B rookie. Wyatt, 22, joins the Magpies from the College of Coastal Georgia in the United States and will be classed under the same rookie category which kick-started the careers of Jarrod Witts and Mason Cox. After spending three years on a basketball scholarship, Wyatt took initiative to change career paths and made initial the contact with Collingwood’s recruiting department. ““It’s really pleasing for us that we can announce the signing of Darrean Wyatt,” List Manager Derek Hine told Collingwood Media. “Most would be aware that our mantra in terms of trying to develop our list or look at other potentials is about looking outside the square. Despite not having played football since his early teens, Wyatt’s athletic 200cm build has the Magpies hierarchy viewing him as a potential key position player. Hine believes that the natural sporting ability possessed by Wyatt can be translated to AFL success. “He comes from down in the southern suburbs and has somewhat of a foundation in terms of Australian Rules football, although he is an elite basketballer,” he said. Wyatt completed a business degree during his time at Coastal Carolina while focussing on a promising basketball career. In his final season for the Mariners he played 28 of the team’s 30 games, including seven starting appearances. Hine believes the 22-year-old brings to Collingwood the hard-working attitude often taught in the US College system and most recently seen in Oklahoma State’s Cox. “We’re excited and really pleased with the way that Darrean attacking the program at this early stage. In addition to helping secure international recruits, a club can sign a player as a Category B Rookie if he has not registered in an Australian Football competition for three years prior to being rookie listed. 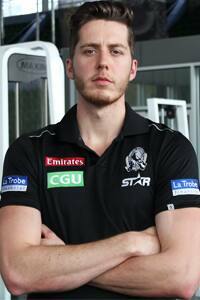 Wyatt has commenced training at the Holden Centre and will spend the next twelve months attempting to prove that he has what it takes to command a position on Collingwood’s primary list in 2016 and beyond. - is a rookie Zone Selection for clubs based in NSW or Queensland.